Tatiana is the latest in a long line of Renko novels - the cop that has been beaten up so many times and exposed to radiation and all manner of shootings it's practically a crime he is still alive in Putin's Russia and probably is. A man without a body is a man without a case. It begins with an illegal demo after a journalist called Tatiana has committed suicide - jumping from her run down apartment block. Of course in Putin's Russia the 'suicide' of journalists almost always means it is state sanctioned murder and Renko knows this as well as anyone. Freedom of speech or the reporting of 'news' is almost all under state control in 2014 as in the days of Stalin. He is beaten up by other cops at the demo and rescued by Anya, his sometime lover and journalist and Max - an old poet on the make driving a bullet proof Zil. Once out of hospital Renko wants to know why there is no body for the deceased and of course no one wants him to look... he obtains a cryptic notebook and audio tapes of the dead journalist and becomes curiously involved. I love the Renko novels. They are like meeting an old friend and they always unpeel yet another layer of corruption in the stinking corpse of the former USSR. Renko is a dogged investigator - his colleagues hate and love him for it. His semi-adopted son is trying to blackmail him to let him go into the Army and has stolen a vital piece of evidence to make it happen. Renko plays along - reels everyone in. 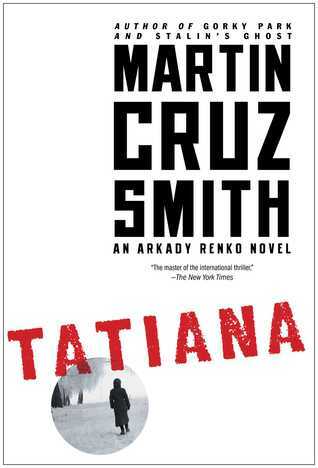 If I have a favourite Martin Cruz Smith it is probably 'Wolves Eat Dogs' but Tatiana is a gripping winter's evening diversion and an excellent reminder of why you don't own anything Russian except vodka.